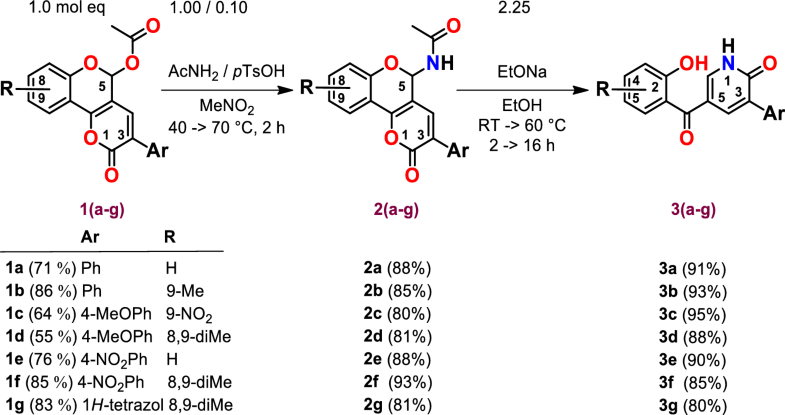 We have developed a novel, simple and efficient methodology for preparation of yet unknown 3-aryl-5-(2-hydroxybenzoyl)pyridin-2(1H)-ones 3(a–g) by EtONa driven re-cyclization of N-(3-aryl-2-oxo-2,5-dihydropyrano[3,2-c]chromen-5-yl)acetamides 2(a–g) in good yields (80–95%). A mechanism for this reaction was proposed. The 3-aryl-2-oxo-2,5-dihydropyrano[3,2-c]chromen-5-yl acetates 1(a–g) were prepared by cyclocondensation from 3-formylchromones (4-oxo-4H-chromene-3-carbaldehydes) and acetic acids in 64–86% yields. Acetamides 2(a–g) were obtained by reaction of 3-aryl-2-oxo-2,5-dihydropyrano[3,2-c]chromen-5-yl acetates 1(a–g) with AcNH2 catalyzed by pTsOH in 80–93% yields. 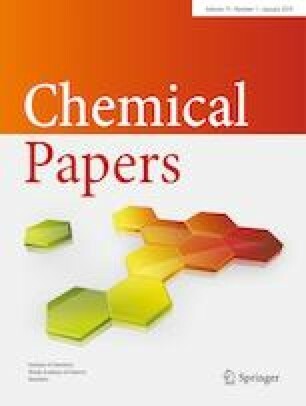 Click chemistry precursors 4(a,d) and 5(a,d) were prepared by propargylation of 3(a,d) in 92–98% yields. They can serve for construction of more complex molecules possessing pyridone skeleton of 3. Eleventh novel compounds 3(a–g), 4(a,d) and 5(a,d) were screened on their anticancer activity on a panel of human tumour cell lines by NCI USA. We found that pyridones 3–5 selectively inhibit the growth of some of the tumour cell lines at 10−5 M (up to -33% compared to a control). The most sensitive tumour cell lines originated from kidney, breast, skin, ovary, blood and lung. The online version of this article ( https://doi.org/10.1007/s11696-018-0566-8) contains supplementary material, which is available to authorized users. This research was supported by the Biomagi, Ltd., NCI USA, VEGA 1/0670/18, Comenius University Science Park funded by the ERDF Grant no. ITMS 26240220086 (HPLC MS). Matúš Čakurda importantly contributed to carrying out experiments and writing of this paper.